Lamb with clams, mackerel with rabbit?????? Sorry but it is Masterchef week. Yes those flavours are served up together and they are delicious. But by the time you read this it will be all over. This is a pop-up which was a sell out with their Tongue in Cheek menu at Cornercopia and has now has a repeat (although 6 months later) with their new Kitchen Dinner menu at the Beehive in Beehive Place. The menu is fixed and called a tasting menu but don’t let that fool you in terms of the portions. 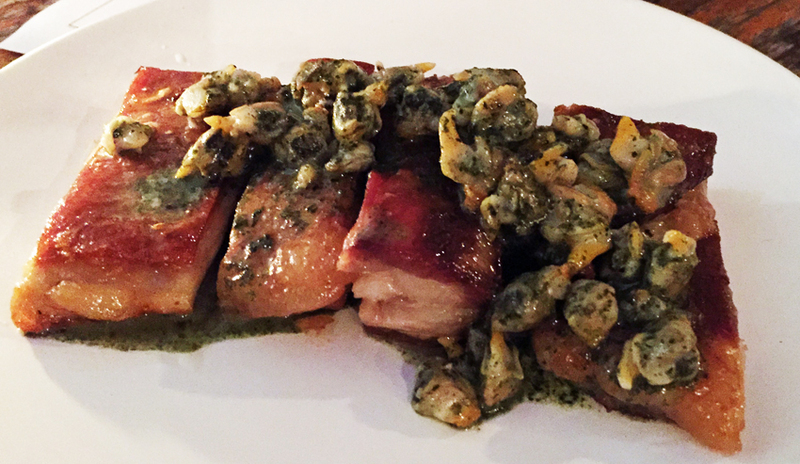 The sharing plates are also conducive to the conversational style of the food. The waiters are always asking for feedback and they really take notice of an empty wine glass and an unopened bottle. We felt really coddled throughout. Tables are shared too and we had a pleasant evening talking about travelling with another couple who had just settled in Brixton. On arrival we were given a martini glass full of rhubarb and grapefruit martini which really did taste of rhubarb. 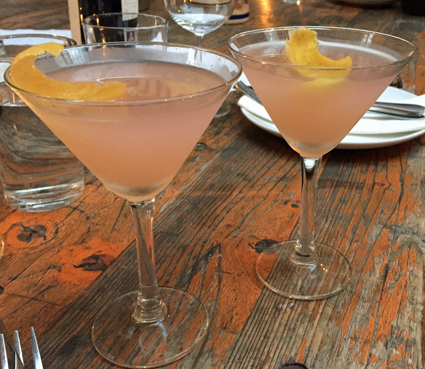 It was too sweet for a martini but certainly loosened the social inhibitions. 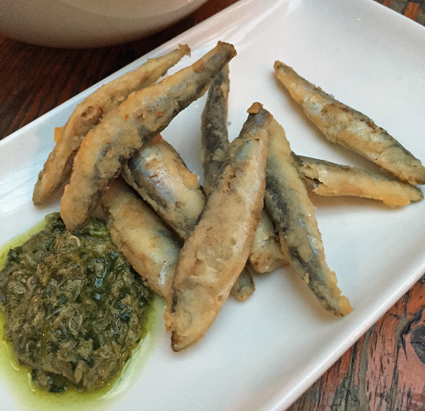 The first course is a nibble – whitebait – and we thought this was the best we had had this year. It wasn’t oily or soggy as large batches often are. It was clearly cooked to order so was crispy and served with capers and herbs and some slabs of sough dough. 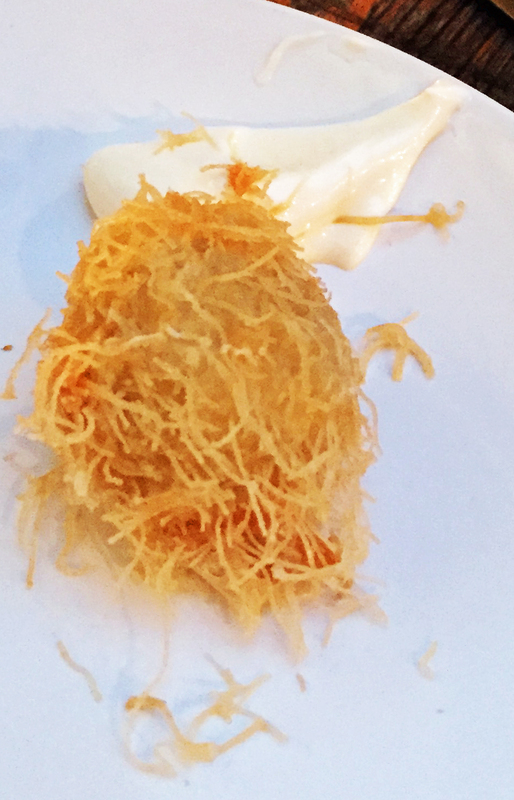 Next came a clever quails egg rolled in shredded pastry and served with burnt lime mayonnaise. On the menu this is classed as a vegetable. The eggs were cooked but still runny but we would have liked much more lime in the mayo and a bit more salt on the eggs. 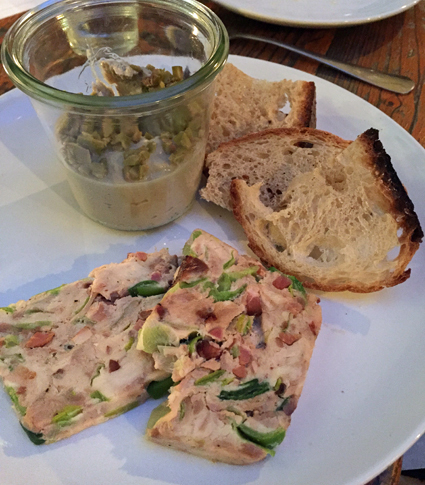 Next came a potted hay-smoked mackerel pate with green olives and a rabbit terrine with leeks served with thin sough dough toast. The different textures went well together but on reflection they both needed a bit more seasoning. 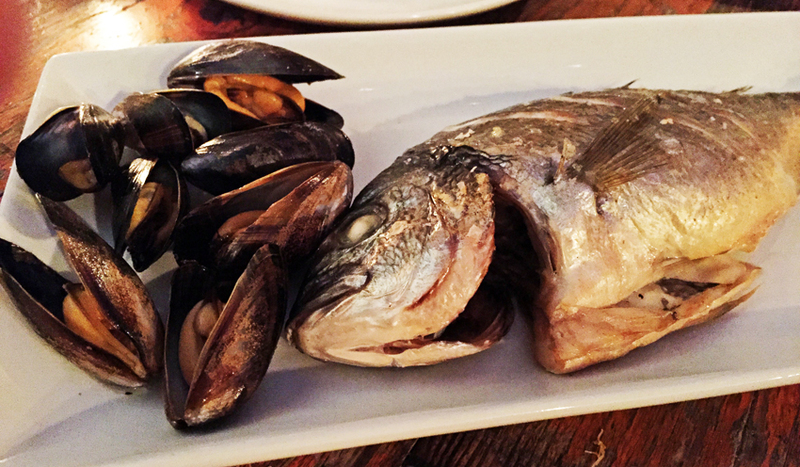 Lamb and clams is not the only thing served up in this level of the meal. You also get a whole Bream. This was a bit more difficult to serve as the lights had gone out and you needed to dissect the bones and be very careful putting anything in your mouth. But I thought the fish was cooked to perfection although my partner thought some bits were slightly under but better that way than overcooked and dry. We polished it all off. The Lamb was beginning to defeat me which was just because I was full and I certainly would have eaten it all if I could have. Neither flavour overwhelmed the other and the textures are similar with the crispy fat on the lamb and the slightly rubbery clams. 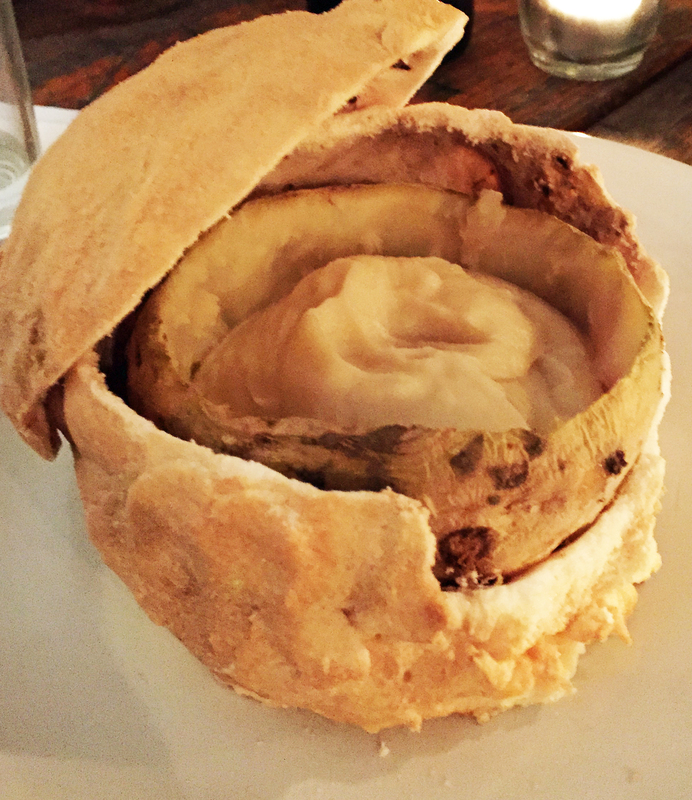 Vegetables are in short supply but at this stage the lamb and fish were served with a salt baked whole celeriac. I don’t generally choose this vegetable as I actually went off the taste of celery some time ago. But I am now a convert to this creamy hot and steamy mixture. It will now go on our list of special dishes for dinner with friends. 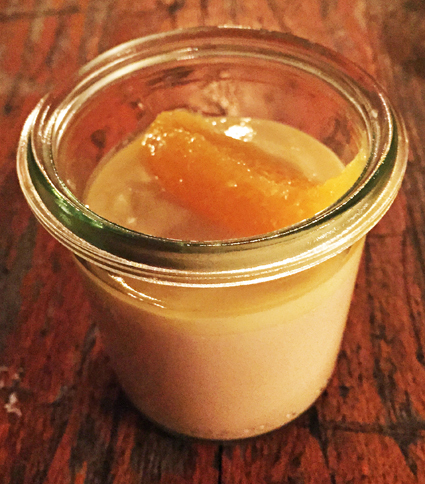 Dessert was a Earl Grey pannacotta with orange curd and a delicious piece of well cut orange on the top. The orange flavour comes at the beginning and then the Earl Grey creeps up on you so you float out of the meal. We are really enthusiastic about this group and would really like to see them stay in Brixton. Their attention to seasonal and flavoursome food really impressed us. The current location really does play to their strengths of a shared eating experience. Their reputation should produce further interest (this was again a sell-out) and we hope a succession of customers. If you see an advert for another pop-up do go. This is interesting and surprising food with out being too taxing. At £35.00 plus £5.00 corkage per person we thought it was a bargain. We took a bottle with us but they also suggest using the local wine shops (Market Row Wines). Well done Billingsfield Kitchen. Do let us know where you end up and we hope it is nearby.